The Start: Early September while eating lunch at work I was expounding about these cool motorcycle trips I've gone on when my buddy Luke says "So...., how long has it been since your last cruise?" In horror I figured the last big ride was over twenty years ago. I said out loud something like "What the hell am I doing?" That weekend while out riding with Heidi on our old Yamaha XS she told me I should be riding a Harley. I like my Yamaha but there is nothing more I need to hear! 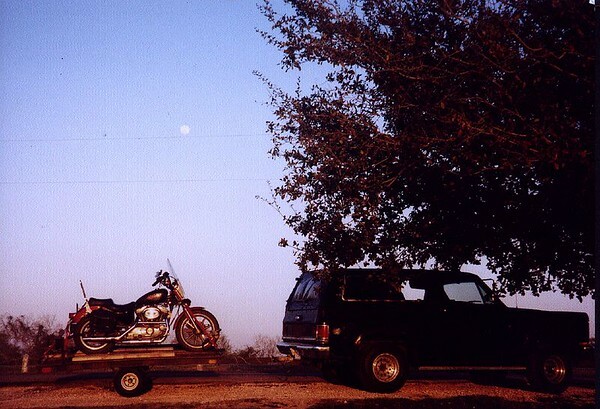 I pick up a 95' Harley Davidson Sportster, XL1200 for a song, or should I say one of those 0% credit card offers. Weeks later its 9/11/01, Heidi calls me at work and we talked as she watches the first tower fall on TV. I run home to spend the day together talking about life and what the rest of ours should be like… I book Heidi a cheap flight to Las Vegas and remember telling her "A team of wild horses couldn't keep me from riding out there!" She thought I was nuts. Two and a half weeks of riding, camping and living it up in Las Vegas, I felt reborn. Now, three months later, my work place is having a restructuring. The word is I don't have to do much more then show up for the next six months until we start our new thing. OK ......Yo! ....Helloooo...! Time for THE BIG Cruise. 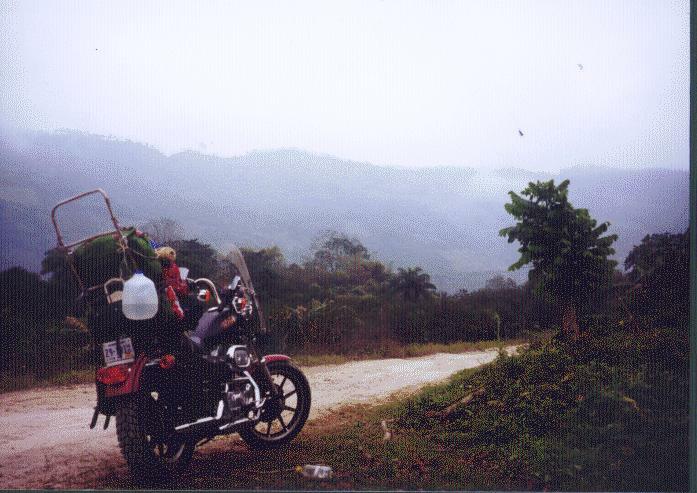 Riding a motorcycle to Central America has been a fantasy of mine since I was sixteen years old. 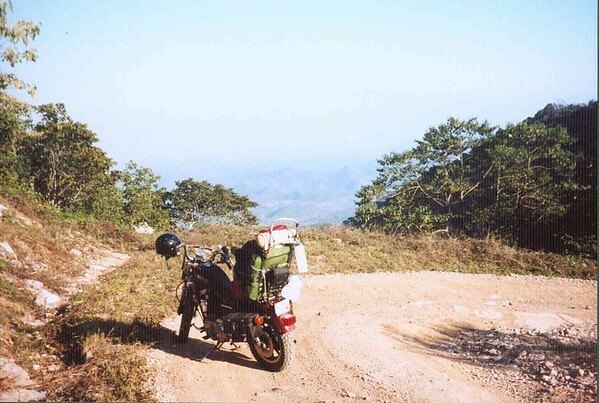 While riding solo on my 350 Yamaha to Yellowstone Park checking out the road atlas I borrowed from my dad, I'll never forget the feeling I had when I saw the road leading through Mexico and Central America. 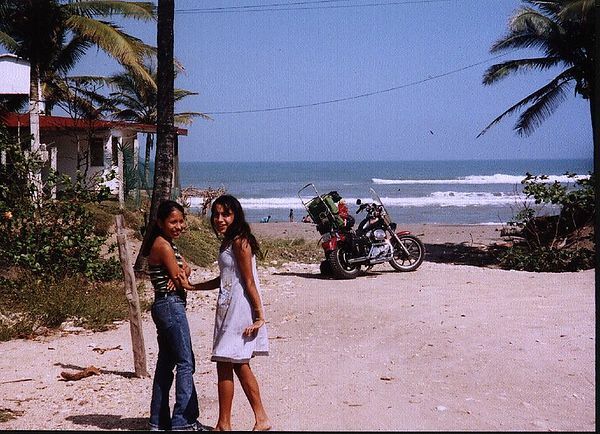 I'll never forget the chill I got thinking about riding into Mexico, communicating with Mexican's and trying to find a place to camp. 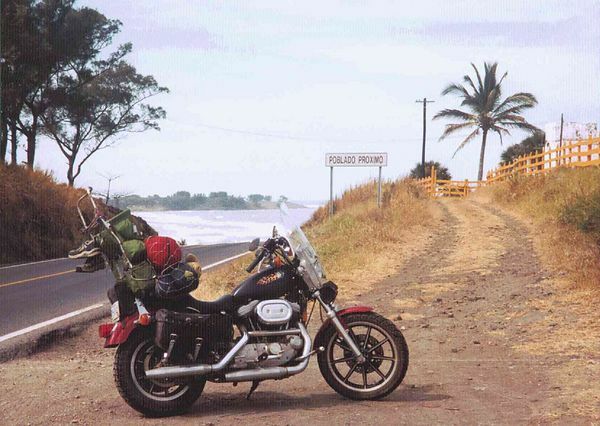 I knew then that some day I would ride south of the border. The TIME is NOW! I Have ... No .....Excuses. Within one month the Sportster has two new 'off-road' tires and an extra large gas tank. The tank is raw and unfinished but a can of flat black spray paint from the hardware store and a couple of flaming skull decal, I'm ready to roll! My excitement has reached a boil, never haven driven in Mexico before and all that bike preparation in such a short time and to a bike I've never worked on before is all adding to the anxiety. Thinking about that new tank and that weird fuel petcock I put in and didn't test does not help. I can't sleep so I'm on the road before 5:00 AM. January is too cold to ride in Wisconsin so I'm heading south in my rusty 86' full size Blazer converted into a small camper with the back seats out. 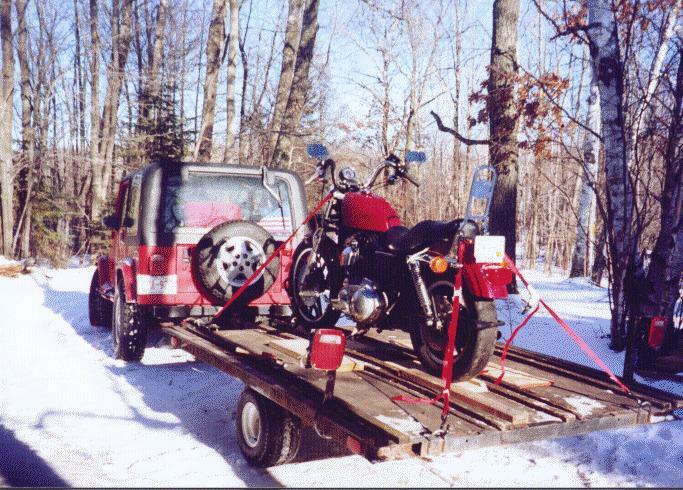 The Harley is being pulled on snowmobile trailer I bought from a friend a couple weeks ago for $100. With the use of the web I have a 10' X 30' storage unit waiting "The Best Little Warehouse in Texas". This is where the Internet is great. I pick a spot on a map close where I think I want to store my truck, go to yahoo!, click on 'yellow pages' select a City near that place then search the yellow pages for keyword 'self storage'. The place has an employee working on-site 6 days a week ready to check me in anytime during business hours. Checking in is smooth. With my own padlock I simply pay for my 5 weeks storage and am given a pass code to let me into the automatic security gate. Bingo, she is pulled right into the unit, trailer attached. A calm cool heightened awareness is setting into me. It is still plenty early, the bike is off the trailer and loaded up with all the gear. I'm still looking over my guide books and maps having all these wild ideas of what the places are going to be like over my routes. My mind and body are on full alert, I'm so alive. My Spanish is ready, my documents are ready, Go. The border is less than 20 miles away, I get up early Sunday morning and head to an out of the way crossing. I am the only person waiting to cross. I go with the flow, get all my stuff 1, 2, 3 and am on my way. Sweet. ... Mexico! I made Ciudad Victoria in no time. A tour company I researched stops here the first night after crossing the border. It’s a nice city but it is early and my plan is to check out the Eco- forest reserve and try to camp the first night, thinking that should add to the adventure. 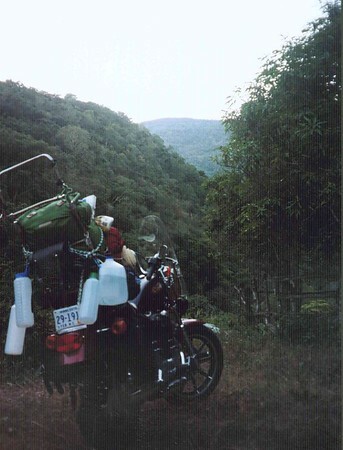 Photo--My First night in Mexico down a dirt path in the heart of the Tropic of Cancer, Eco-Forest Reserve. The trail is hardly noticeable from the road but I've been practicing looking for camping spots like this ever since I can remember. The trail ends at this old corral. It looks like a good spot to camp and is. That evening and the next morning is filled with loud weird sounds. Waking up here is so cool, Espresso coffee, the perfect camp spot, screeching exotic birds with the feeling I was in a foreign land. I have a tightness in my throat thinking about where I am and what I'm about to do, Yeah! Obviously I don’t know how available water is going to be in Mexico. I start a zigzag pattern the second day having fun with the maps. The further inland I go the cooler the landscape. Map reading and navigation is everything. Towns mostly have new names and roads are marked as to what town is down it. Way way cool! This IS the adventure I 'm looking for but at the same time I'm thinking 'what the hell am I doing!' While checking out the mountains I don’t want to get to close to Mexico City. I've read stories about the heavy traffic in the City and I don't want any of that. Photo - This road should have taken me to the other side of this ridge that was plainly visible while driving along. Then it should have led to a road toward the coast. Beautiful ride, I end up in some small village way up in the hills. It seems like the village is having a celebration at the town square. I found out later it is just a normal Monday. This is great, I'm really liking life. I am totally lost in the Mountains for over a day. The road (or trail) is this steep and steeper. It seems like I am standing on my pegs for hours and spitting rocks out with my rear tire as I goose it to keep my balance. All three maps I have show a connection between two highways. One map even showed a red line, I'm thinking a state highway. There is none and 50% of the towns listed are either not there or the names have changed. I did find some beautiful Mexican villages on my way to nowhere and had a great time. In the mountains along the road there isn’t much unused flat land open for camping. The little villages I came through have zero tourism and the motels are not obvious and look way primitive even to me. 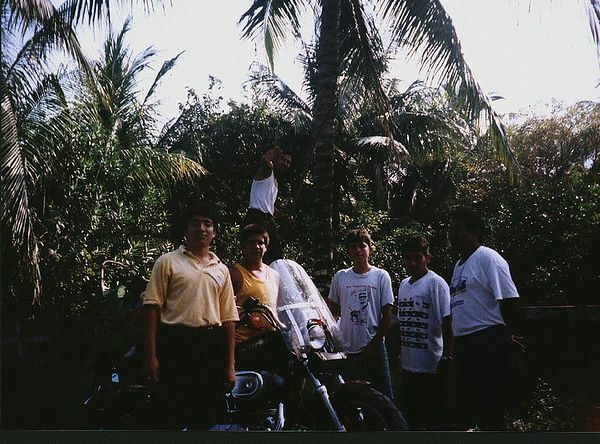 That night I camp on a Mexican family's driveway, with their permission. They are unreal friendly people. The man of the house keeps telling me he has never met an American before and he wants his sons and daughter to meet me, or I think that's what he is saying. The kids hang out with me all morning. After I use up all the Espanol I know, they just have a ball watching me pack up my gear. Super pleasant and well mannered kids. I have to double back further north to highway 70 east then south on 180 to Tuxpan. The roads are good now and the coastal scenery is awsome, like riding into a dream. 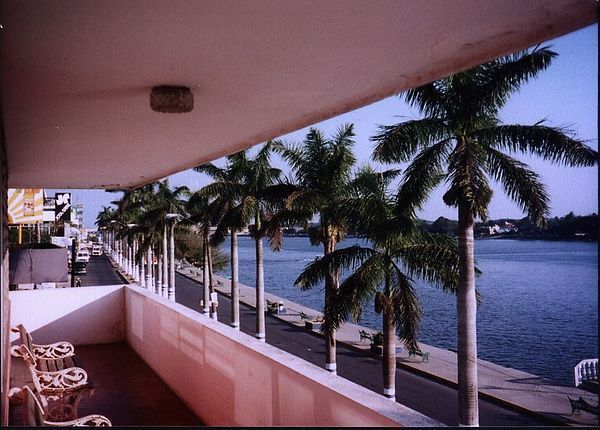 My guidebook talks about Tuxpan being a small and lively tropical port City, I have a good idea what that means. I check into a motel room right across the street from the water and a half-mile or less from town square, $26. That night guard has me pull my bike into the motel lobby, standard procedure. Near the town square there are a lot of bars and small shops. The bars reminded of a place where a ships crew would hang out and get some fool drunk, and then the drunk would wake up and find himself the next day in a ship headed out to sea to be part of the crew. There is a lot of live music playing and a lively atmosphere everywhere, and no tourists. This is Mexico, the one I came to see. The bars always have a few Chica’s lined up ready to serve the customers or sit with the customers and drink or dance or whatever@*~, ? I feel in my element here, I don’t know why. This is the view from my room. A billion birds race along the shore from tree to tree just outside my room. 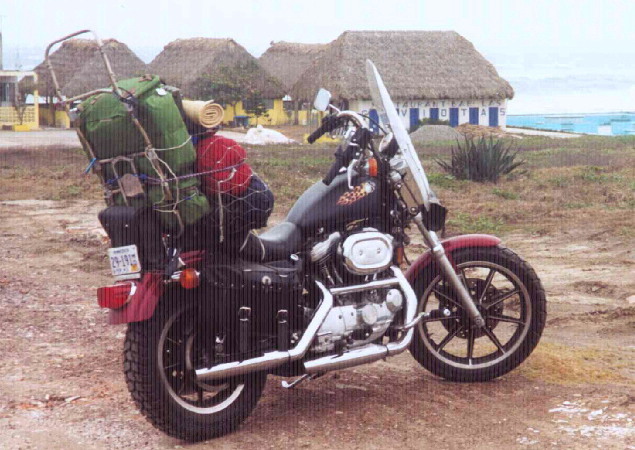 Cruising south of Tuxpan is fantastic, good roads with seascape. It's Mexico's Emerald Coast. I drive my cruising buddies crazy. I like to stop often and smell the roses or in this case check out all the pre-Columbus archeological sites. Maybe that's why I cruise alone a lot? These guys try to flag me down on my way down the trail but I want to get to the site. On the way back out I stop. They give me a coconut out of the tree and talk. People have so friendly here in Mexico. I often draw a small crowd wherever I pull over.